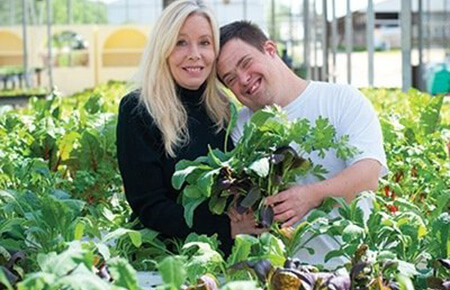 LetUsConnect Farm will provide an environment for individuals with disabilities to thrive by offering guidance, support, and preparation for economic self-sufficiency. Many misinformed people discount the true potential that individuals with disabilities possess by generalizing them based on their “limitations”. LetUsConnect Farm will work with every adult learner on a personal level to identify their strengths and goals in order to bring them out of the confined world in which they are often forced to live in. Through these initiatives, LetUsConnect Farm will strive to foster a proud and vibrant community where individuals with disabilities will achieve community inclusion, personal growth, and job flexibility – all while enhancing the lives of others. Our business model touches upon many of the environmental, social, and employment issues facing the world today. Our environment-friendly method of hydroponic farming not only preserves nature’s most valuable resources, but also offers increased nutritional value, as well as fights the growing epidemic of obesity by promoting natural and healthy vegetable consumption. LetUsConnect Farm’s vocational training program will revolutionize the way many people think about agriculture. Utilizing hydroponics to provide individuals with disabilities the opportunity to become employed and gain a sense of dignity and respect amongst their peers puts an innovative spin on the meaning of social entrepreneurship in the 21st century. *The Bluetooth Low Energy (BLE) communication technology powered by iBeacon will be integrated with ColorsKit One – an award-winning autism intervention and program developed by Rangam – to train individuals how to locate various objects utilizing their smartphones.